The return of Nolan Ryan to the 2014 Astros as an executive adviser got me thinking about his days as a pitcher and his duels against the Cardinals. In researching which Cardinals had the most success against Ryan, I discovered Ted Simmons (.353 career batting average versus Ryan), Joe Torre (.318), Lou Brock (.263 with 11 walks) and Ken Reitz (.385) did well against the right-hander who has 324 wins and is the all-time leader in strikeouts (5,714). 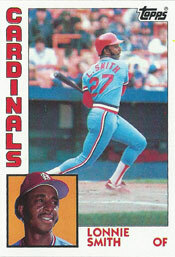 The Cardinals hitter who tormented Ryan the most, though, was Lonnie Smith. A right-handed batter, Smith has the best career batting average and best career on-base percentage of any hitter with at least 30 plate appearances against Ryan. Smith hit . 500 (12-for-24) with five walks versus Ryan. He also twice was hit by Ryan pitches. Smith’s on-base percentage against Ryan is .613. Smith had eight singles, a double, a home run, four walks and twice was hit by pitches in seven games with the Cardinals against Ryan. Smith is part of the reason Ryan posted a losing career record (10-13) versus the Cardinals. The first and last games Smith played as a Cardinal versus Ryan may have been the most significant. The grand slam was Smith’s first home run in two months (since June 28 off Mark Thurmond of the Padres) and his first with a runner on base in two years (since Aug. 14, 1982, off John Candelaria of the Pirates). Ryan hadn’t given up a grand slam in seven years (to Pat Kelly of the 1977 Orioles) until Smith delivered his stunning shot.